Making chili is warm and satisfying, especially during this winter!!! I love making a huge batch and then having it all week for lunch or a quick leftover meal for dinner (love leftovers!). This weekend I’m making it of course for the Superbowl. No pizza and wings in this house. Instead, we’re going to have a hardy and healthy meal while we watch the commercials, uh, I mean the game. I’ll be making a batch of my corn muffins to go along on the side as well as a big salad. I’ve always added a beer to my chili to give it a little depth. 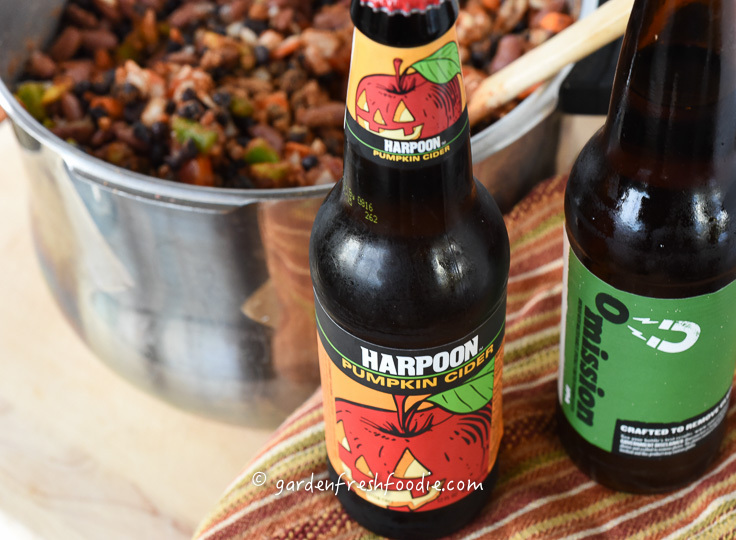 In this one, I used a hard cider instead, but I’ve also used the Omission gluten free beer as well. So this chili uses up some of my butternut squash, onions, and carrots that I get from my winter share at my local CSA (community supported agriculture), the Root Down Farm. Feel free to add in what ever ingredients you have on hand. If you have some frozen corn from the summer, add that in too! 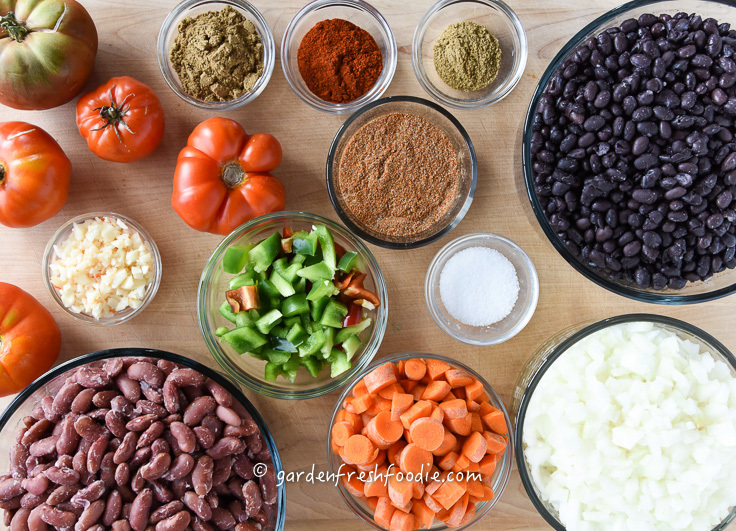 Incorporating more beans into your diet is a really important thing to do. They add fiber, plant-based protein, magnesium, and potassium. They help to lower blood pressure and blood sugar. Power to the bean! They taste wayyyy better (especially chick peas-soooo much better!)! amoxicillin order now How do you make your own beans? Easy! If you are interested in doing this, I HIGHLY recommend a pressure cooker. The one I recommend is a Fagor brand, and I have the large 10 quart capacity one. It sits on my stove because I use it at least 4xs a week (some days multiple times in the same day). On the day of chili making, or the day before, I make my beans. 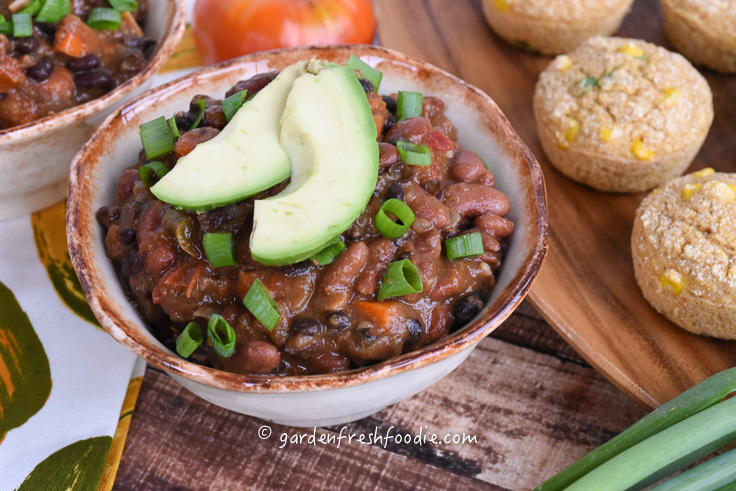 You can even batch cook them and make a whole lot, placing them into freezer-safe containers to whip out when you need a good bean! Love when I have things prepped ahead! Soak your beans the night before, or in the morning of the day you wish to make them, for at least 8 hours. Drain, and rinse. 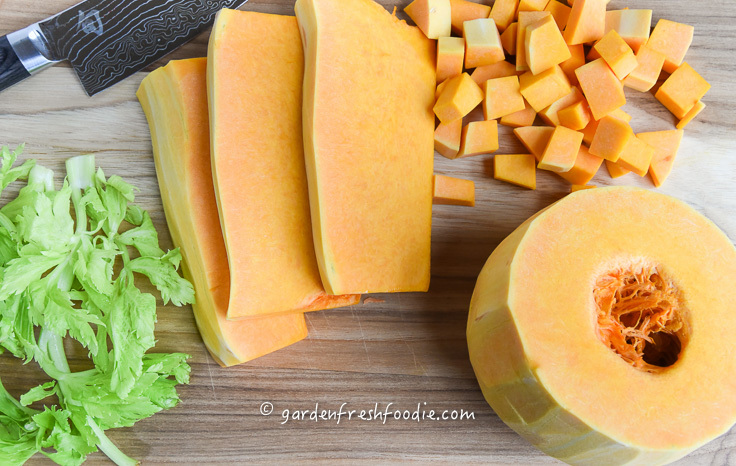 Add them to your pressure cooker or stock pot and cover with water. If using a stock pot, cover with about double the amount of water, as it will evaporate during cooking. Pressure cookers don’t allow for evaporation, and therefore, just cover your beans with water, making sure to have about an 1-2″ extra. In pressure cooker: bring to pressure and then lower heat and cook for about 11-12 minutes, depending on the bean. For traditional stovetop: bring to boil, reduce heat to low and simmer for 1 1/2-2 hours until softened. See how much faster a pressure cooker is? Plus no boiling over mess, as can happen in a regular pot. We serve this dish with our oil free corn muffins and a big salad. This makes a big pot of chili. If you’d like less, cut amounts in half. We love to have a big batch for leftovers, plus it freezes perfectly for a quick weeknight meal and is great as leftovers for lunch or turned into burrito night! Also you can top the extras on a sweet potato. Yum! Place all ingredients into pot at once, simmer on low, until liquid is absorbed, and chili has cooked down, about 1 1/2 hours. Serve over brown rice and topped with avocado slices and hot sauce, if desired. 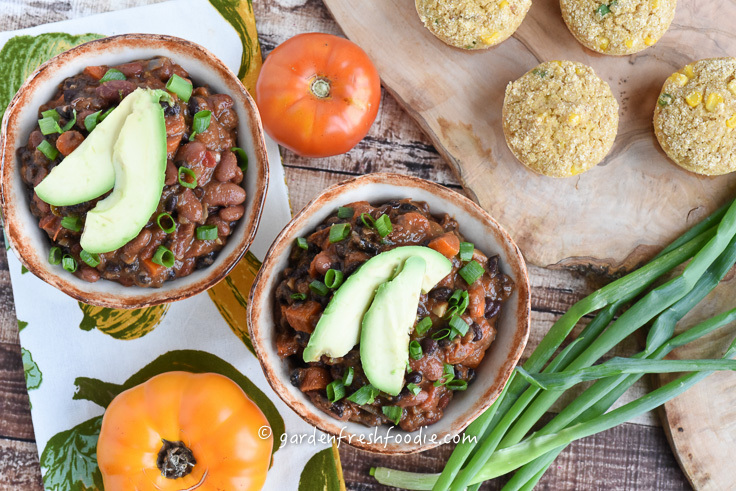 Chili goes perfectly with my corn muffins too or as leftovers on top of a sweet potato! 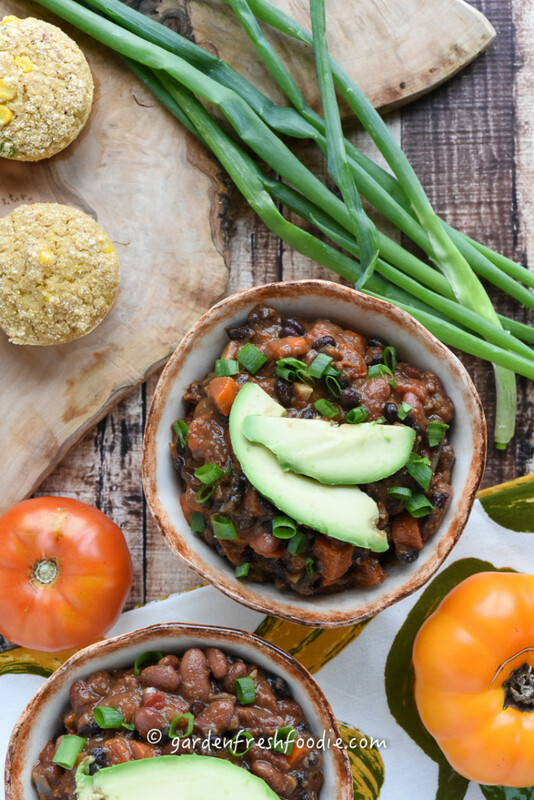 Butternut Squash Veggie Chili-made with lots of veggies to boost your immunity in the wintertime. Makes a great dish for the Superbowl or any big gathering. Place all ingredients into pot at once, simmer on low, until liquid is absorbed, and chili has cooked down, about 1½ hours. 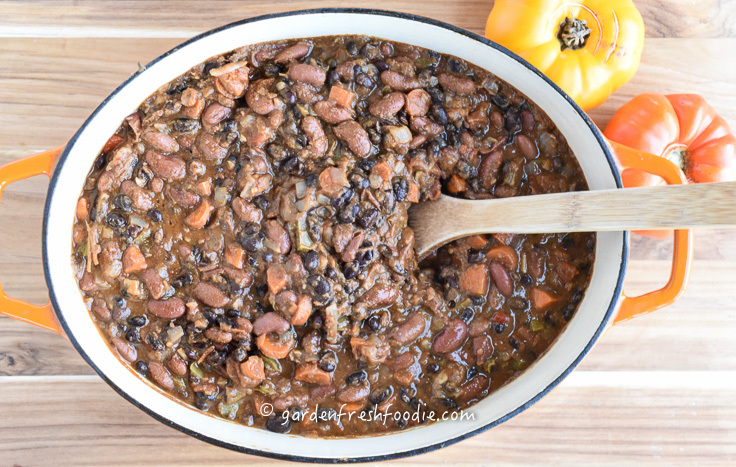 How would you adjust this recipe to make it in the pressure cooker? Debbie-if you want to make this in a pressure cooker, you can up the water a bit. It may never come to full pressure, as it does need liquid to so so usually. I would add a little more water and even if it doesn’t come to pressure, it will still cook much faster. Let me know!